Grilling doesn’t stop with meat and veggies at our house! 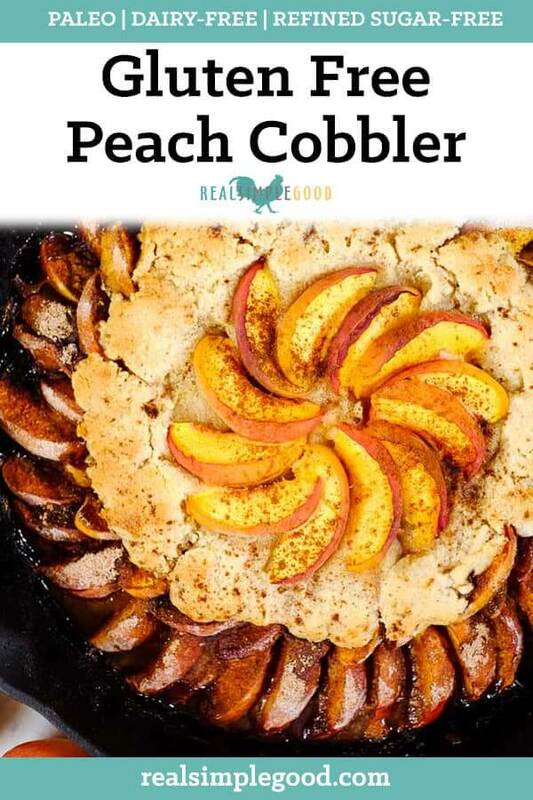 We love grilling fruits and even desserts like this gluten free peach cobbler! 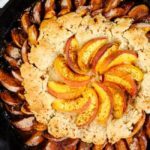 Summer desserts are some of the best treats, and this gluten free peach cobbler is Paleo, dairy-free, refined sugar-free and egg-free too! You can grill it or bake it in the oven, and it’s a healthy peach dessert your entire family will love! 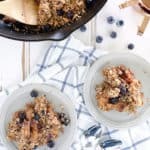 We love that making a gluten free and Paleo cobbler is really super easy, easier than you think! The way we do it only requires one mixing bowl too, which is even better because who wants to spend more time doing dishes?! For the peach filling we just slice up some peaches and spice them up with cinnamon and nutmeg. We do add a little coconut sugar, but you could leave it out if your peaches are super ripe and sweet! 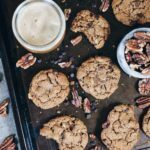 We also add a little bit of tapioca flour to help make them all gooey and delicious when they cook up in the grill or oven. You might think making a gluten free cobbler topping would be a challenge. I won’t lie, our first go at this one didn’t quite go as planned. Ha! The flavor was good, but the consistency was not. 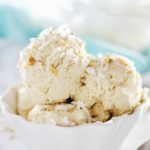 Sooo…I played some more and am happy to report that you’re going to love this buttery (but still dairy-free) topping. 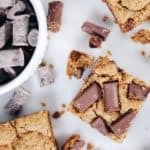 It’s the perfect combo of savory and sweet and you’re going to enjoy it! 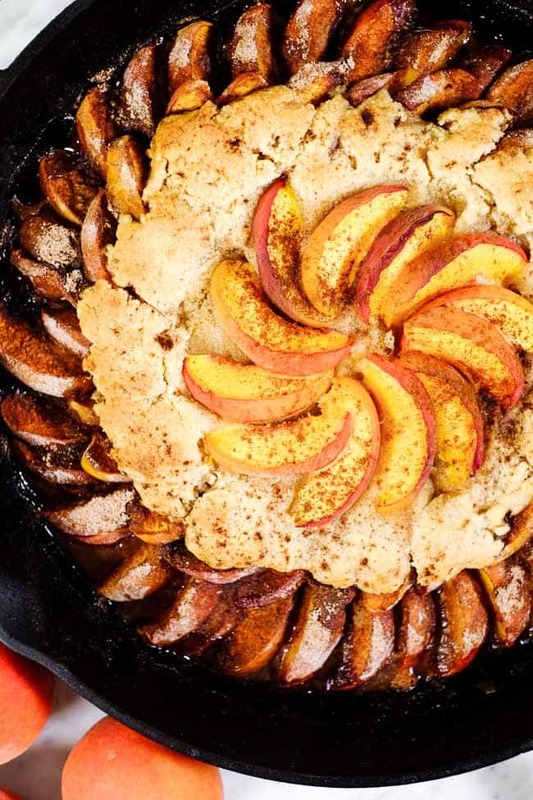 I can’t actually take credit for the beautiful styling of the skillet for this gluten free peach cobbler. Justin followed my recipe and made it up in the morning while I was teaching barre classes, so it would be ready to take photos of when I got home. I know…he’s the best! Like seriously! 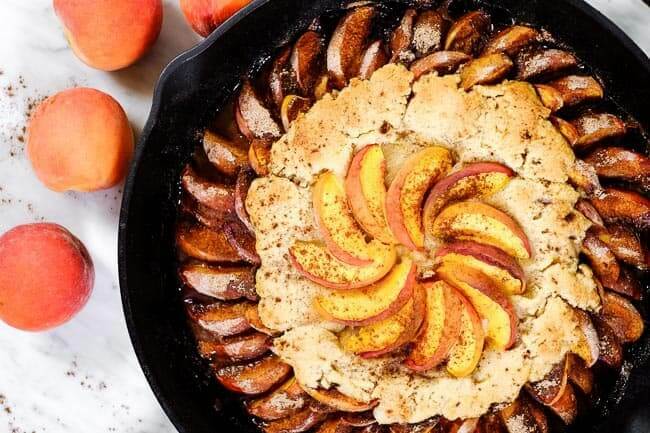 (insert all the heart eyes) You can totally replicate the fancy look or the peaches to really impress your family or guests, or you can just toss all the peaches in the bottom of the pan and add the topping. 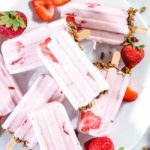 Your family and friends are going to be so happy with the flavor either way! They’ll never suspect it’s Paleo and gluten free! 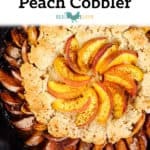 Whether you’re trying to impress some guests or just want a healthier summer dessert, make this gluten free peach cobbler! 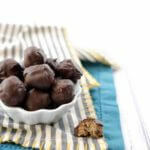 It’s easy to make and a crowd-pleaser for sure! Leave a comment below and let us know how it goes. Also, take a photo and tag us on Instagram @realsimplegood, so we can check it out! Give us a follow if you don’t already, too! 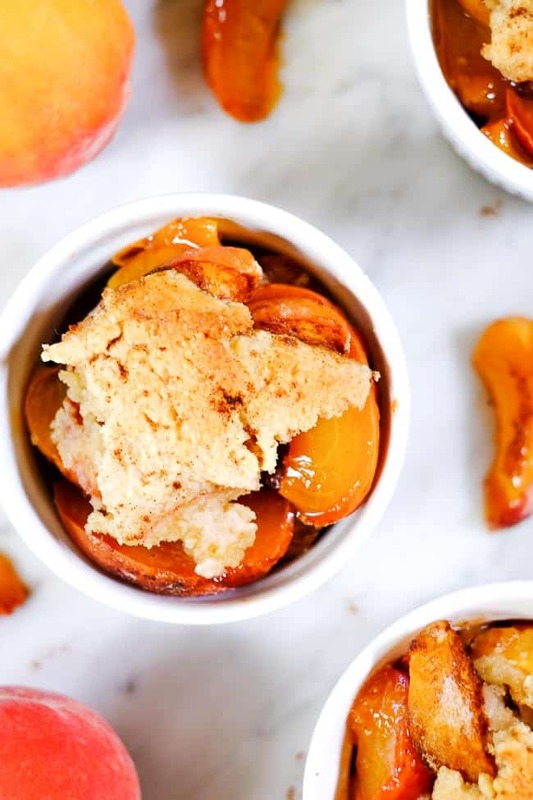 Summer desserts are some of the best treats, and this gluten free peach cobbler is Paleo, refined sugar-free and egg-free too! It's a healthy peach dessert your entire family will love! Preheat grill or oven to 375° Fahrenheit or medium heat. Place filling ingredients in a large mixing bowl, and stir to evenly coat peaches. Transfer to cast iron skillet. In the same mixing bowl, add almond flour, tapioca flour and sea salt. Stir to combine. Add melted coconut butter, coconut milk, maple syrup and vanilla. Mix again to form batter. 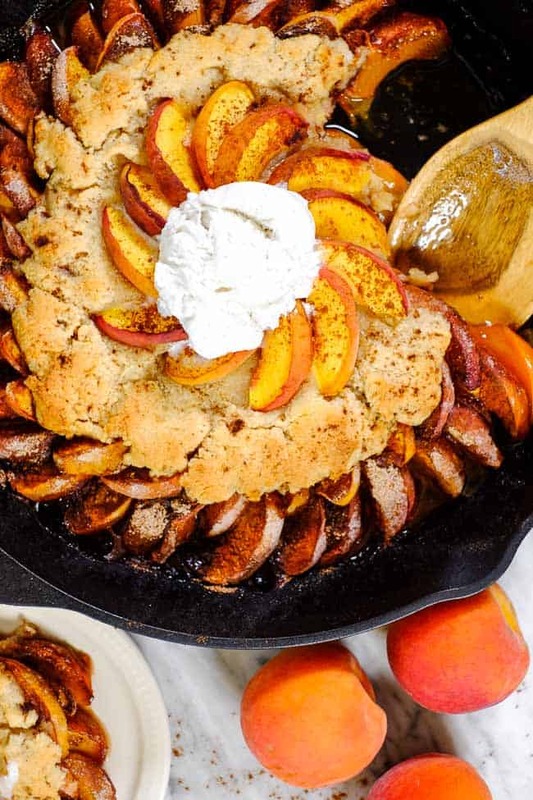 Use a spoon to drop dollops of the batter on top of the peaches, leaving some gaps and space around the perimeter of the skillet.